Tonight all I ate was a big bowl of cabbage. And I loved it. Red cabbage carbonara where have you been all my life. 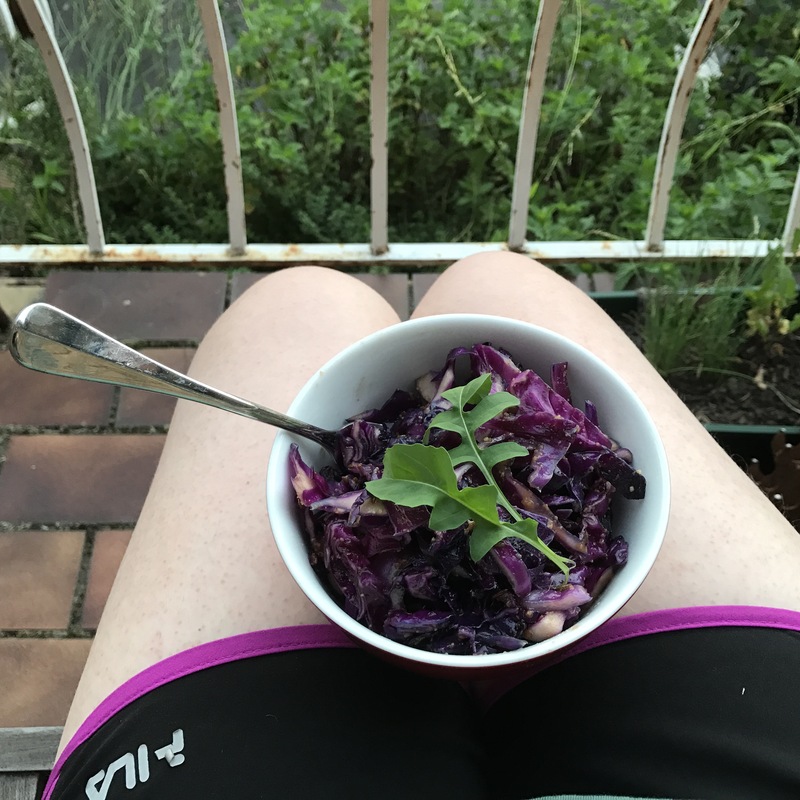 There appear to be hundreds of cabbage carbonara recipes in the low-carb blogosphere. Here and here are the two recipes I used for inspiration. But there’s very little overlap between the low-carb (mostly meat-heavy) blogosphere and vegetarian blogosphere, so I’d never seen this done. Necessity is the mother of invention. I thought I’d invented something new when all I had in my fridge tonight were eggs and a 1/4 of a cabbage. It appears the low-carb world has me beat by several years. But I’m claiming the (genius) idea of making this recipe vegetarian, through the amazingly inventive modification of eliminating the bacon. I love the taste of cabbage and the creamy yolk made sure that the Parmesan and pepper clung to each strip, making every bite tasty. I never felt like I was eating a bowl of cabbage and I didn’t feel the dish was missing anything. However, you could easily add some tofu bacon pieces or some fried shallots for crunch if you wanted. This recipe was so simple and the time to make it was well under my seven-minute time frame, even stopping to take the occasional picture. I’m on Instagram @sevenminutevegetarian and I’d love to connect with more people there, so let me know if you’re on Instagram too.